Wes Hammond has created a collection of stories about his growing up in Irvington, California in the years before World War II. Wes remembers the people, businesses, homes, farms, and automobiles of the local residents of the town in a very enjoyable fashion. 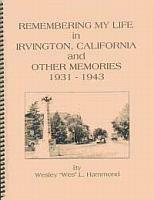 The book is filled with pictures and illustrations of Irvington and its residents.